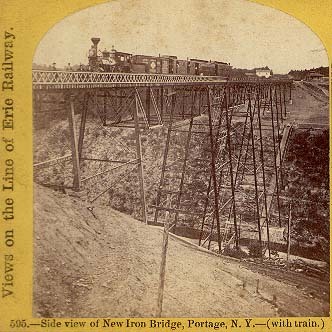 "Views on the Line of the Erie Railroad." L.E. Walker, Publisher, Warsaw. NY. This stereoview was taken from the west side of the bridge, probably in the early fall of 1875. It shows a passenger train stopping on the bridge, with the passengers enjoying the breathtaking view. Click here for a larger view. For more information, please see our Glimpse of the Portage Bridge.